The latest revolution in the sports nutrition and supplement industry is the revelation that real whole foods can work as well as or better than pharmaceutical drugs or manufactured supplements, without the negative side effects. The human body has many biochemical pathways and mechanisms we have yet to fully understand. Whole foods contain many compounds which may act synergistically to provide an overall effect beyond that which a manufactured supplement or product can match. Research is proving that we benefit from choosing whole natural foods time and time again. The latest darling is tart cherry juice and scientists are verifying it is a superfood that has performance-enhancing benefits for endurance athletes. Athletes focused on fast recovery, sharp mental processing and high training motivation, need top quality sleep. This can be hard to come by for athletes with a non-stop lifestyle and high stress schedules. Tart Montmorency cherries contain melatonin, a phytochemical critical in regulating sleep cycles. Studies have shown consumption of tart cherry juice concentrate increases melatonin levels.1 This improves sleep duration and quality. 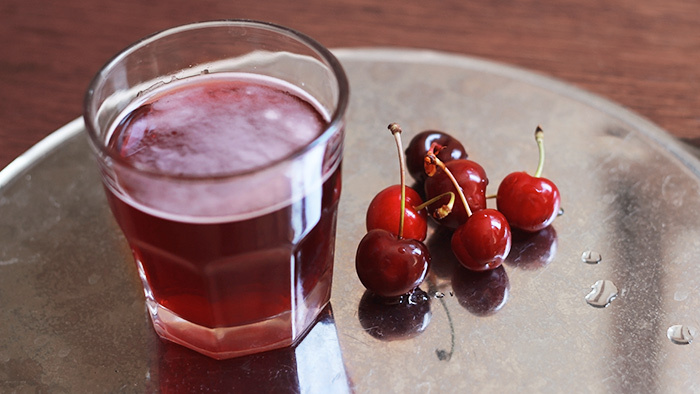 Add a dose of tart cherry juice to your bedtime snack to sleep like a baby. Increasing sleep will enhance recovery and make you happier. As a bonus, tart cherry juice has been shown to do even more for athletes by reducing inflammation, reducing muscle damage, increasing cycling economy and maximum strength following high-intensity exercise. To get better sleep, drink one fluid oz of tart cherry juice concentrate diluted in 5 to 8 fl oz of cold water, 30 minutes before bed. Tart cherries contain a high concentration of anthocyanin, a flavonoid that has similar anti-inflammatory properties to non-steroidal anti-inflammatory drugs (NSAIDs), such as ibuprofen and naproxen.3 Inflammation related joint issues such as osteoarthritis are common in master’s athletes. Sore joints will slow you down by reducing training volume and intensity. Drinking tart cherry juice can significantly reduce joint pain without the side effects often associated with arthritis medications and NSAIDs. It is always more fun to train when your joints don’t hurt which encourages you to get out there and push hard. To reduce joint pain, drink one fluid oz of tart cherry juice concentrate twice per day. To reduce muscle pain, drink one fluid oz of tart cherry juice concentrate twice per day for seven days prior to and on the day of the event or workout. Hard bouts of training and racing are well known to depress your immune system. It is crushing to finish off your last big training block before a peak race and then get sick. Tart cherry juice can reduce the incidence of upper respiratory tract symptoms5 and keep you healthy and ready to smash your goals. To give your immune system a boost, drink one fluid oz of tart cherry juice concentrate twice per day for seven days prior to and on the day of the event or workout. Research has verified the benefits of both tart cherry concentrate and the powdered form.6 Tart cherry juice tastes great and is a nice bedtime snack. As a bonus, mix in 20g of the slow digesting protein casein to boost your protein synthesis while you sleep. Take another dose of tart cherry juice the following morning to maximize the performance-enhancing benefits it has to offer.